Modified Cordless electric drill: If one takes out the variable speed trigger switch and uses a diode (one way flow device) in series with the permanent magnet motor then we have a unit that can stay hooked up to a battery without acting like a motor. When one cranks, it charges the battery. This becomes a dedicated one direction DC generator without the added losses of the small amount of resistance of the variable speed trigger switch. The following items can be removed from the 14.4 Volt drill. The white wire from the PM motor is positive when cranked counter clockwise facing the chuck and negative when cranked clockwise for the 14.4 Volt drill. There is also an internal 3 wire component (transistor or SRC I don't know which) that has a heat sink that can sometimes be rewired to act as a diode. Do this in a pinch or emergency, not recommend using if you have a diode available. A diode will work more reliably. For the 14.4 volt drill this 3 wire component will flow in one direction when the black wire is hooked to a positive source (the motor-generator) and the white is negative. I found this component will not work for the 12 and 18 volt drills as a diode. Sometimes it blocks the flow and sometimes is does not block the flow (unreliable). 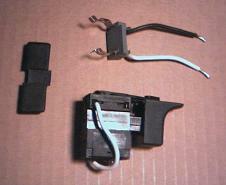 Use a 4-6 cell battery and check current flow of this 3 wire component in the blocked direction. This back flow test should be well below one ma. If it is not, then use a rectifier diode from another source (junk parts). Otherwise your batteries will slowly discharge, if left hooked up and not turning. For this 3 wire component I found for the 14.4 volt drill and clockwise cranking to hook black to black. 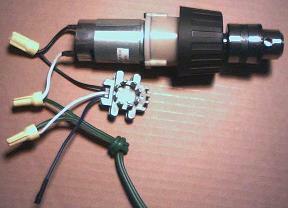 For counter clockwise cranking hook white motor lead to black diode lead. Note that the blue wire is not used and is left disconnected but taped up with electrical tape so it will not short to anything. A diode must be used with the 12 and 18 volt units. When turning the chuck clockwise facing the 12 volt drill then the black lead from the motor is positive and red is negative. Note that one can use say 4 three amp diodes in parallel if that is all one can find. For the parts taken out of the 12 volt drill and the end result see the photo on the left. 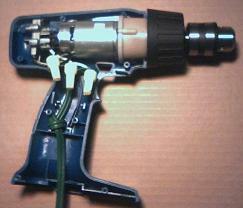 The following is the basic circuit of how to hook up a cordless drill to charge a single cell. Notice that no switch is needed. This will be true as long as the reverse flow on the diode chosen is very low. The amp and volt meter are for testing once satisfied all will work ok they can be removed from the circuit as in the photo on the right. The crank can be made from an 11" long by 3/8" diameter plated treaded rod. Bend at 1" and to make a 5" cranking radius. The rest of the length becomes the handle. Make your bends gentle and not too sharp or it will break. Find a chunk of round wood (closet coat hanger dowel is about right) and drill a 3/8" hole through the middle of it. Slip over the shaft and put a nut on it with lock tight or epoxy in the threads (to make it stay in a permanent location). I also tested a 3/8" ID rubber hose as a handle but didn't like it as much as a bigger diameter wood approach. Optional: Sand or file a flat on three sides of the 3/8" threaded rod to keep it from coming loose easily in the chuck of the drill. I experimented with different radiuses and handles. The one that worked the best for me is the one with the round wood dowel handle at a 5 inch radius. 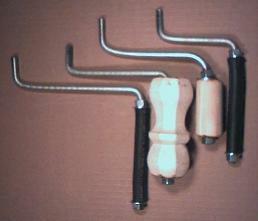 These are the wooden handle ones in the picture. The 12 volt and 14. 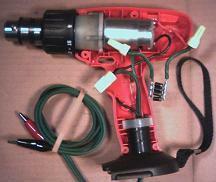 4 volt hand crank modified drill generator weighs about 2 lb 2 Oz with the lead wires and clips. The crank is about 6-7 Oz. Total weight is about 2.5 lbs. What to do with the battery packs that come with and plugs into the drill. This now becomes a source of single cell batteries that can be individual charged. One takes the cover off and attaches a wire to each end of each cell without taking the series string apart. These wires are run to the outside of the case where the alligator clips from the drill generator can be used to charge each cell individually. Then depending on the voltage needed to run the intended device one can tap off the voltage needed. Another way is to break them into individual cells charge them separately and rewire temporally back into a series to get the voltage necessary to run radios or lights. Output test results of hand cranking One Cordless Drill. Comfortable Hand crank speed is about 80-90 RPM (normal cranking). High speed is about 1.5 to 2 times that speed. Fast cranking open circuit 4.1 volts max and 1 to 2 amps at 2 volts or an average 1.5 amp x 2 volts = 3 watts. Normal Cranking produces .2 to ..5 amps at 1.5 volts or an average of .35 amp x 1.5 volts = .5 watts. Fast cranking open circuit 5.4 volts max and 2.5 to 3.5 amps at 1.9 volts or an average 3 amp x 1.9 volts = 5.7 watts. Normal Cranking produces 1.1 to 1.6 amps at 1.6 volts or an average of 1.35 amp x 1.6 volts = 2.2 watts. Fast cranking open circuit 5.4 volts max and 1.2 to 1.5 amps at 3.1 volts or an average 1.35 amp x 3.1 volts = 4.2 watts. Normal Cranking produces .3 to .6 amps at 2.75 volts or an average of .45 amp x 2.75 volts = 1.2 watts. Fast cranking open circuit 3.9 volts max and 2 to 3 amps at 1.9 volts or an average 2.5 amp x 1.9 volts = 4.8 watts. Normal Cranking produces .9 to 1.4 amps at 1.6 volts or an average of 1.15 amp x 1.6 volts = 1.8 watts. 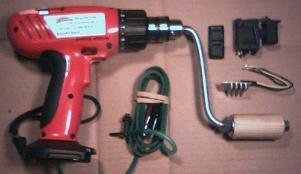 Summary: Hand cranked cordless drills can be converted to generate a small amount of electricity in an emergency. Expect to charge a one cell at about 1 to 3.5 amps or 2 to 5 watts. For each watt of power generated for one minute (1 watt-minute) will run one white LED for 15 minutes. Thus 5 watts generated for one minute theoretically could result in 75 min run time for one LED. In practice one would need to charge 3 separate cells to get the necessary voltage to run one LED. The cells could be charged all at once in parallel then rearranged in different battery holders to be wired in series to run the LED(s) or charge each cell separately while staying connected in series. Bottom line: In an emergency one could crank out enough power to keep a night or task LED light going while it is needed.